Come enjoy the unique comedy of Piff The Magic Dragon and his loyal pup, Mr. Piffles. You'll be wowed as you watch this unexplainable magic show! Hurry and book your tickets today to get Exclusive Pricing! Save $28 per ticket to see Piff the Magic Dragon live at the Flamingo Las Vegas. Be sure to compare all offers to get the best rates for the show you wish to attend. Enjoy the magical antics of Piff and Piffles, the only magic dragon and Chihuahua show on the Strip! Fresh from a North American tour and hot off the stage of “America’s Got Talent,” Piff the Magic Dragon and his Chihuahua sidekick Mr. Piffles hit the ground running in Las Vegas and landed at Bugsy’s Cabaret at the Flamingo. Their unique comedy magic show draws from a vast repertoire of performances at places like Radio City Music Hall and the Sydney Opera House. The critically acclaimed solo show is a great way to celebrate the holidays. 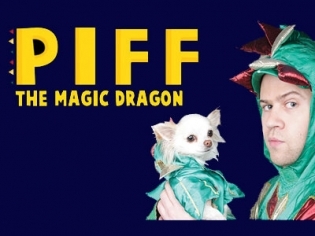 Rated PG-13, Piff is sure to bring big laughs and mind-blowing magic to the stage. Check out the extra dates for the holiday season and grab seats for the Piffmas Piff-tacular.